It is believed in traditional Tibetan history that the spread of Buddhism to Tibet was brought about by holy activities of Buddhas and Bodhisattvas and mainly through the efforts of Bodhisattva Avalokitesvara. The spread of Buddhism to Tibet was itself prophesied by Lord Buddha in the Manjusrimulatantra. Prior to the spread of Buddhism to Tibet, Tibetan's indigenous religion and culture was Bon. Buddhism began to spread to Tibet in two disseminations beginning with period of the Three Great Religious Kings. The first religious king was Song-tsen-gam-po of the Yar Lung dynasty, 33rd in the royal linage (ca. 618-650). This king was the emanation of the Bodhisattva Avalokiteshvara and he opened the door and established both the Buddhist religion and the political order. He built the great Potala palace and two temples in Lhasa. Under his reign, a legal system combining religious and secular principles was established. The king himself also gave oral teachings of Bodhisattva Avalokiteshvara. The second religious king was Tri-song-de'u-tsen, 37th in the royal line, an emanation of the Bodhisattva Manjushri (ca. 740-798). In this period, Buddhism flourished immensely with the coming together of the Abbot- Shantaraksita and the Preceptor- Padmasambhava who were invited to Tibet by the King. From here, the translation of Buddha's teachings were carried out, the assembly of monks were established and the first monastery in Tibet, the temple of Samye was built. The two system of laws- the religious law and the laws of the kingdom, was further spread and strengthened. The third religious king was Lord Ral-pa-can, 39th in the royal line and an emanation of Vajrapani. This king continued to build Buddhist monasteries and by royal edict, he appointed seven families for the support of each group of four monks. He also standardized the translation language for religious texts and established the methods of translations and transmissions of Buddha's teachings. The death of Ral-pa marked the end of the first dissemination in Tibet, after which Buddhism went quiet in Tibet. Buddhism was revived in 1042 in Tibet, with the arrival of Lord Atisha marking the start of the second dissemination. From hereon, Buddhism firmly established its roots in Tibet. In 1244, Sakya Pandita, the head of the Sakya Tradition of Tibetan Buddhism, became the ruler of the whole of Tibet when he was appointed regent by the Mongol ruler Godan. In 17th century, the Gelupas became rulers of Tibet and in 1642, the 5th Dalai Lama (1617-1682) became the first Dalai Lama to rule Tibet, this tradition continued until today until the 14th Dalai Lama (b. 1935) fled Tibet after the change of circumstances there in 1959. Four schools of the Tibetan Buddhism had arisen in the first and second disseminations of Buddhism to Tibet. The Nyingma Tradition is the oldest school of Tibetan Buddhism, which was founded during the first disseminations of Buddhism to Tibet in 8th century. The remaining three schools were founded in the second dissemination. The Kagyu Tradition was founded by Marpa, Miarepa and Gampopa. This tradition stemmed from the teachings of great India Mahasiddhas such as Naropa. The Gelugpa Tradition was founded by the 14th century philosopher Tsong Khapa and during 17th century which became the dominant political force in central Tibet. The Sakya School was founded by Khon Konchok Gyalpo in 1073 where he established the Sakya monastery in south central of Tibet. Within the Sakya School, there is the principal branch of Sakya and the two main sub-sects of Ngorpa and Tsharpa. The roots of Sakya tradition grew from the ancient times when three brothers of a celestial race descended from the heaven of clear light into Tibet in order to benefit beings. Sometime after their descent, they found themselves in conflict with a group of demons known as Rakshas. During this conflict, a love affair ensued between one of the clear light gods, Yapang Kye, and the raksha daughter Yatuk Silima. They bore a son named Khon Bar-kye meaning 'he who is born between love and strife'. This was how the name Khon came to be known in Tibet. The members of the Khon family then became students of Guru Padmasambhava and one of the Khon sons became one of the first seven Tibetans to receive monastic ordination. From this time until 11th century, the Khon family were supporters and followers of the old school Nyingma tradition. New Tantras began to arrive in Tibet in 11th century and the old school began to decline, Khon Konchok Gyalpo (1034-1102) decided that the Khon family should also seek out on the new Tantras. In the water buffalo year of 1073 Khon Konchok Gyalpo founded the Sakya monastery in Tsang province of south central Tibet which marked the start of the Sakya tradition. Lord Buddha Shakyamuni himself prophesied in the Manjushri tantra that a Sakya monastery would cause the teachings to flower in Tibet. Lord Atisha (982-1053), on his way from India to Tibet in 1040 C.E, was said to have made offerings in the location where the monastery would later be built known as "white earth" and he also prophesied that this place would witness one Bodhisattva Avalokitesvara incarnation, seven Bodhisattva Manjushri incarnations and one Bodhisattva Vajrapani incarnation. Through many years of Tibetan history, there were indications that these visions had materilised. The word "Sakya" means "white earth" in Tibetan and the Sakya tradition is named after the patch of white earth where Lord Atisha made these prophesies. In 12th and 13th centuries, the Sakya tradition rose to a prominent position in Tibet. This rise of position was brought about by the efforts of the Five Great Sakya Masters: Sachen Kunga Nyingpo (1092-1158), Sonam Tsemo (1142-1182), Jetsun Dapka Gyaltsen (1147-1216), Sakya Pandita (1182-1251)and Chogyal Phakpa (1235-1280). After them, there were the Six Ornaments of Tibet: Yakton Sangye Pal, Rongton Sheja Kunrig, Ngorchen Kunga Zangpo, Dzongpa Kunga Namgyal, Gorampa Sonam Senge and Shakya Chogden. The main branch of the Sakya tradition is currently under the leadership of 41st throne holder of Sakya, His Holiness Sakya Trizin of the Drolma Podrang. As with other traditions of Tibetan Buddhsim, a number of sub-divisions of the Sakya tradition also emerged from the main Sakya tradition. The two main sub-sects are the Ngorpa sub-sect and the Tsharpa sub-sect. The Ngorpa sub-sect was founded by Ngorchen Kunga Zangpo (1382-1457) with the establishment of the Ngor Evam Monastery in 1430. The current head of Ngorpa sub-sect is His Eminence Ludhing Khenchen Rinpoche. The Tsharpa sub-sect was founded by Tsarchen Losal Gyatso (1502-1556) with the establishment of the Dar Drongmoche Monastery. The current head of Tsharpa sub-sect is His Eminence Chogye Trichen Rinpoche. 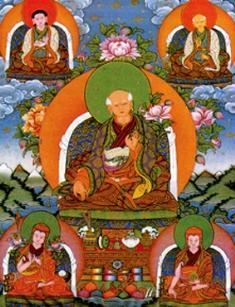 Lamdre is the golden and the central teaching and practice of the Sakya tradition. The term Lamdre is a Tibetan term meaning "the path including its result". It originated from the one of the great Indian Mahasiddhas, Virupa. Lamdre contains teachings and practices covering the whole range of sutra and tantra teachings given by Lord Buddha. But its main teachings are based on the Hevajra Tantra. Lamdre was brought to Tibet by the Tibetan translator, Drogmi Lotsawa, in the middle of 10th century, and was later codified in 12th century by Sachen Kunga Nyingpo. This teaching has since been passed down through an unbroken lineage of masters to the present day. During the time of Muchen Sempa Chenpo Konchok Gyeltsen, Lamdre was divided into two sub-traditions: The Explanation for Private Disciples or the uncommon Lamdre (Lobshey) and the Explanation for the Assembly or the common Lamdre (Tshogshe). It is said that Lamdre is the complete path to enlightenment, and is divided into two parts: the preliminary section and the tantric section. The preliminary section contains the instructions and teachings on sutras of Lord Buddha and focuses on the three visions: impure vision, the vision of experience and the pure vision. The tantric section is esoteric or tantric teachings, which include teachings on the Three Tantras. Lamdre is given by a single teacher (who is an officially recognised lineage holder) in a single place over a period of four to six weeks generally. Within the Sakya school, wherein the Lamdre lineage lies, there are only a handful of lineage holders in any generation. His Eminence Kyabje Dorje Chang Luding Khenchen Rinpoche is the 75th Head of the Ngor sub-sect of the Sakya tradition. His Eminence was born to the clan of Shang, Sharchen or Ludingpa in the female sheep year of 1931 near the great seat of Ngor Ewam monastery called Pangshal. The clan of Shang, Sharchen or Ludingpa is renowned for producing scholars and siddhas of different Buddhist sects. The position of Head Abbot of Ngor was traditionally held for a three year period in which extensive teachings are given almost non-stop. The three year periods alternate between the four monastic Houses (ladrangs); Luding, Khangsar, Thartse and Phende. Due to the Chinese take-over of Tibet in 1959 and the disruption to the Ngor monastic system, His Eminence Luding Khenchen Rinpoche effectively led and maintained the Ngor School up to 16th March 2000. It was then that His Eminence Luding Khenchen Rinpoche's nephew (Her Eminence Jetsun Kushok Chimey Luding's son) - His Eminence Luding Shabdrung Rinpoche - was enthroned at Ngor Pal Ewam Choden Monastery, Manduwalla, India, as the 76th abbot of the line. So therefore, His Eminence Luding Khenchen Rinpoche's nephew is now known as 'His Eminence Luding Khen Rinpoche', while we address His Eminence as 'Luding Khenchen Rinpoche'. Being the eldest in this family, His Eminence Luding Khenchen Rinpoche was ordained as a monk at the age of ten by the most gracious Khenchen Sharchen Jamyang Thupten Lungtok Gyaltsen Palsangpo. For the next thirteen years, His Eminence was blessed with the pith instructions of Lamdre, several initiations, oral transmissions, advice, grammar, poetry and so on from Khenchen Sharchen. His Eminence's other teachers include the two Khenchens of Ewam Khangsar Ladrang, His Holiness Sakya Trizin and His Eminence Chogye Trichen Rinpoche. For almost four continuous years from the age of seventeen, His Eminence was in retreat, practising mainly the sadhanas of Hevajra and other deities. In 1954 at the age of twenty-four, His Eminence was enthroned as the Abbot of the Ngor Ewam Choden Monastery. In 1959, after the invasion of Tibet, His Eminence left Tibet and fled to Darjeeling, India. In 1961, His Eminence established the Ngor centre in Gangtok, Sikkim. In 1965, under His Eminence's guidance, Kyegu monastery was re-established in Kamrao, Himachal Pradesh. His Eminence also re-established the Ngor Pal Ewam Choden Monastery in Mandawala, North India. His Eminence has contributed greatly to the Dharma by giving continuous teachings, empowerments, oral transmissions and re-establishing summer retreats in various Sakya monasteries in India, Nepal and other Sakya centres overseas. His Eminence has given the precious Lamdre teachings fifteen times, and has bestowed initiations and instructions mainly on the Thirteen Golden Dharmas of the Sakya tradition, the Seven Mandalas of the Ngor tradition and other deities. His Eminence has ordained over twelve thousand monks and nuns. His Eminence Luding Khenchen Rinpoche is the 75th Abbot of Ngor Ewam Choe Dan Monastery, which is the seat of the Ngor Lineage of the Sakya Order of Tibetan Buddhist Tradition. Ngor Monastery is the head of hundreds of other branch monasteries such as the great Kyegu Monastery in Kham, eastern Tibet. For over 500 years, the very name "Ngor Monastery" has been synonymous with great learning. This tradition of unequalled scholarship and practice continues today. 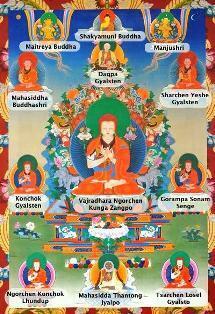 Ngor Monastery was founded in 1429 by the great master Ngorchen Kunga Zangpo. Prophesized by the Buddha, he was a brilliant scholar, teacher, and vajra master. The Monastery was named Ngor Ewam Cho Dan because while it was under construction, Ngorchen Kunga Zangpo dreamt that the collection of all Dharma arise from the letters E and WAM. Every year since the Monastery has been established, the Ngor Abbot has bestowed the precious Lam Dre teaching cycle, as well as the majority of full ordination ceremonies and countless other teachings to thousands of Sakya sangha members who gather from the branch monasteries. The Lam Dre, or Path and its Result, is the major Vajrayana practice of the Sakya tradition. It condenses both the sutric and tantric paths to enlightenment in three-month long secret oral instructions. The Ngor Monastery has now been re-established by His Eminence Luding Khenchen Rinpoche in a quiet forest near Manduwala, in Uttranchal, in Northern India. Through his skillful and wise leadership, the Monastery has now fully re-established the performance and training of monks in all of the annual 'drubchot' great tantric rituals, it is a flourishing training school for young monks with a retreat centre, library, and Sakya Pandita shrine. Construction of a tantric college for in-depth study of the tantras is in progress. Today, hundreds of monks travel great distances to enroll in the Ngor Monastery school of ritual studies and to participate in the annual grand rituals, maintaining Ngor Monastery's ancient heritage as a seat of learning and the headquarters for training of monks. Thus, the Ngor tradition has not only been completely re-established, it has been spread throughout the world.